Radiant Floor – Wood Joists | Reflectix, Inc. Note: Installation instructions and illustrated drawings are recommendations only, while proper local construction methods are the responsibility of the installer. This application is ideal for a radiant floor system above or below a wooden (joist) sub-floor. The benefits provided by Reflectix® are dramatic. In addition to an impressive R-21, the reflective film provides a 96% reflectivity of radiant energy back into the system. The product has the added attraction of ease of handling and installation. The Reflectix® Double Reflective Insulation consists of two layers of highly reflective film (96% reflectivity) that are bonded to two tough layers of polyethylene. Two inner layers of insulating bubbles and a center layer of polyethylene provide this easy to handle product with high strength and reliability. Note: Not for use in direct contact on surface temperatures that are 1800 F or greater. Note: For all methods, inspect the structural integrity of the sub-floor and make any needed repairs before installing Reflectix®. Begin at one end of the house. Insert the first course of Reflectix® half way up into the joist cavity and staple (at approximately 3” to 4” intervals) the edge of the product to the side of the joist. The goal is to split the joist cavity into two approximately equal enclosed air spaces. Continue with the second course of product at one end of a joist cavity (after the first course has been installed) and secure the product “end” with staples to the sub-floor or band board. Proceed down the joists by stapling each edge (or middle of the Reflective/Bubble/Bubble/Reflective 48” wide product) to the face of each joist. Staple the product at intervals of approximately 3” to 4”. Enclose the entire joist run(s). 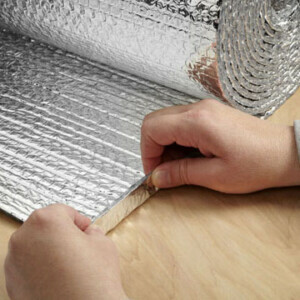 Seal seams with Reflectix® Foil Tape to create a vapor/moisture barrier. Repeat for each joist that contains the Radiant Floor System. Begin at one end of a joist cavity (that contains the Radiant Floor System) and install the product “end” with staples to the sub-floor or band board. Proceed down the joists by stapling each edge (or middle of the Reflective/Bubble/Bubble/Reflective 48” wide product) to the face of each joist. Staple at intervals of approximately 3” to 4”. Enclose the entire joist run(s). It is possible to install the Reflectix® inside the joist cavity (utilizing the Reflective/Bubble/Bubble/Reflective, Staple Tab product). Start at one end of the house. Tuck the Reflectix® into the joist cavity. Each edge of the product has a 3/4” staple tab. Determine the depth inside the cavity that the product is to be installed and attach the product with staples (through the tab) at approximately 3” to 4” intervals. Repeat on opposite joist. The less air space between the product and the sub-floor, the lower the R-Value (although reflectivity will be maintained). It is possible to install the Reflectix® inside the joist cavity above a mass insulation batt. Refer to Method #3 for installation procedure, air space options and resulting R-Values. 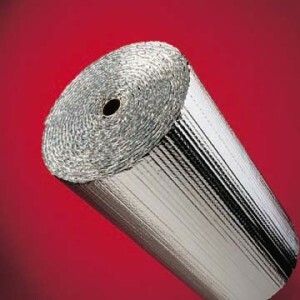 Reflectix® can be installed below the mass insulation batt. Finish with an interior panel below the Reflectix® (typical when finishing a basement). ALWAYS check local building codes before installing Reflectix®. ALWAYS check the area you are insulating and make any needed repairs. Any worn wiring should be replaced before you begin installing Reflectix®. ALWAYS make sure work areas are well ventilated and well lighted. ALWAYS use eye protection when operating a staple gun. ALWAYS use caution and common sense when using a staple gun. Be aware of electrical wiring locations. Stapling into a wire can cause severe shock or death. NEVER staple into electrical wiring. ALWAYS be careful when working with large pieces of Reflectix® on windy days. When installing Reflectix® on bright sunny days, it is best to wear sun glasses. Do not work in areas such as attics when temperatures are too hot. Please Note: The intention of these Installation Instructions and 3-D renderings are for the sole purpose of illustrating the correct location and relative position of the Reflectix® products in specific building assemblies. The correct construction methods and techniques are the responsibility of the installer or contractor. The methods outlined are recommendations on location of the Reflectix® products as a guideline. There are no claims on the part of Reflectix, Inc. that these building assemblies are finite standards or meet building code requirements (as they can vary by region).